An orifice meter is a conduit and a restriction to create a pressure drop. An hour glass is a form of orifice. A nozzle, venturi or thin sharp edged orifice can be used as the flow restriction. In order to use any of these devices for measurement it is necessary to empirically calibrate them. That is, pass a known volume through the meter and note the reading in order to provide a standard for measuring other quantities. When the velocity decreases as the fluid leaves the orifice the pressure increases and tends to return to its original level. All of the pressure loss is not recovered because of friction and turbulence losses in the stream. The pressure drop across the orifice increases when the rate of flow increases. When there is no flow there is no differential. The differential pressure is proportional to the square of the velocity, it therefore follows that if all other factors remain constant, then the differential is proportional to the square of the rate of flow. BETA RATIO is the ratio of orifice plate bore divided by pipe I.D. is referred to as the Beta Ratio or d/D where d is the plate bore and D is the pipe I.D. The orifice plate bore can be made in many configurations to handle various flow measurement jobs. The flowing conditions should be checked to see which of the configurations is suitable for each measurement job. In the design and use of orifice plates, several basic factors must be followed to assure accurate and reliable measurement. The upstream edge of the orifice must be sharp and square. Minimum plate thickness based on pipe I.D., orifice bore, etc. is standardized. The plate should not depart from flatness along any diameter by more than 0.01 inch per inch of the dam height (D-d)/2. To conform with recommended practices, the orifice-to-pipe diameter ration d/D (called Beta ratio), must not exceed recommended limits. The eccentric plate has a round opening (bore) tangent to the inside wall of the pipe. This type of plate is most commonly used to measure fluids which carry a small amount of non-abrasive solids, or gases with small amounts of liquid, since with the opening at the bottom of the pipe, the solids and liquids will carry through, rather than collect at the orifice plate. The opening in a segmental orifice plate is comparable to a partially opened gate valve. This plate is generally used for measuring liquids or gases which carry non-abrasive impurities such as light slurries or exceptionally dirty gases. Predictable accuracy of both the eccentric and segmental plate is not as good as the concentric plate. The quarter-circle or quadrant orifice is used for fluids of high viscosity. The orifice incorporates a rounded edge of definite radius which is a particular function of the orifice diameter. The conic edge plate has a 45° bevel facing upstream into the flowing stream. It is useful for even lower Reynolds numbers than the quadrant edge. These taps are located one inch from the upstream face of the orifice plate and one inch from the downstream face with a + 1/64 to +1/32 tolerance. 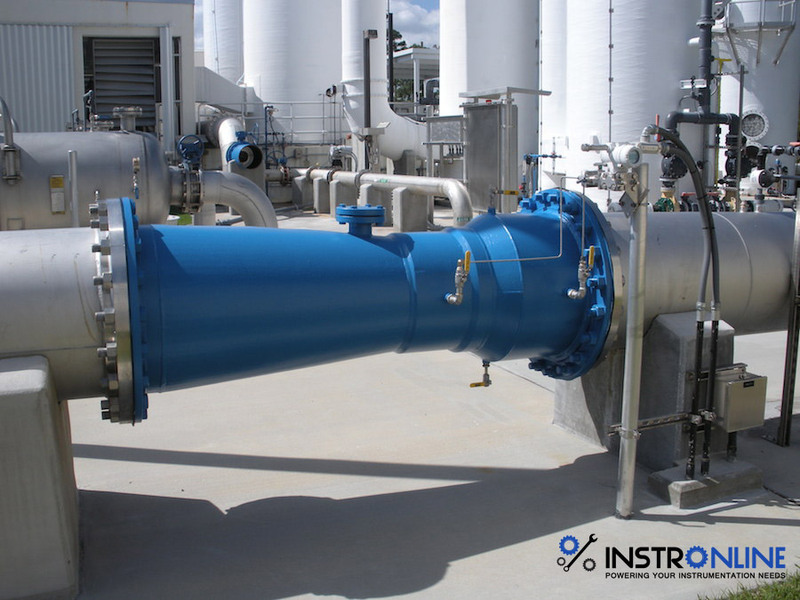 These taps are located 2½ pipe diameters upstream and 8 pipe diameters downstream (point of maximum pressure recovery). Flange taps are almost universally used in the United States with some older meter stations still using pipe taps. These taps are located one pipe diameter upstream and at the point of minimum pressure downstream (this point is called the vena-contracta). This point, however, varies with the Beta ratio and they are seldom used in other than plant measurement where flows are relatively constant and plates are not changed.Exact dimensions are given in appropriate tables. These taps are located immediately adjacent to the plate faces, upstream and downstream. Corner taps are most widely used in Europe, in line sizes less than 2 inches they are used with special honed flow meter tubes for low flow rates. 1. Meter manifold piping should always be installed to enable calibration as well as to protect the differential element against over range. 2. The meter should be installed as close as possible to the orifice fitting. 3. Always slope the manifold lines gently from the orifice fitting to the meter to eliminate any high or low points in the manifold lines. 4. Use condensate chambers or air traps to remove either liquid from a gas system or gas from a liquid system if lows or highs in the manifold piping cannot be avoided. It is important when pressurizing or depressurizing differential measuring devices to apply or release pressure to or from the high and low meter chambers uniformly, so as not to impose excessive overange.